With Cal Eco Yosemite cancelled the team was looking for another event to fill in the weekend. 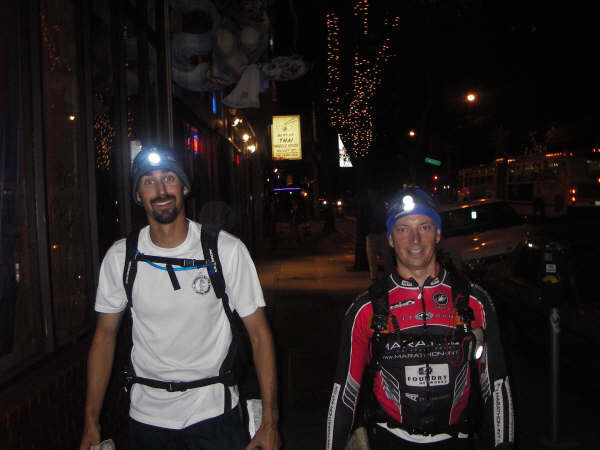 I’d raced the previous 2005 Day and Night with Jen Klafin and Oliver Pohl. We ended up winning in 2005 by taking the most points on a course that was designed to be challenging enough that the top teams couldn’t get all the checkpoints in the time given. This year the 3 of us had gone onto different teams and it looked like we’d all be racing against each other for 2006 honors. This would be a fun one. I e-mailed Peter Pensotti of team Aquan and asked if he was looking for additional training for Primal Quest and he jumped on the opportunity to race with ARNavSupplies.com/Nomad for the weekend. We arranged to meet at the start venue around 1:45 PM so as we would have some time for introductions and gear adjustments before the maps were handed out. With the Yosemite event cancelled, we were expecting some tough competition as the Bay Area teams looked for another event to practice for the upcoming PQ. 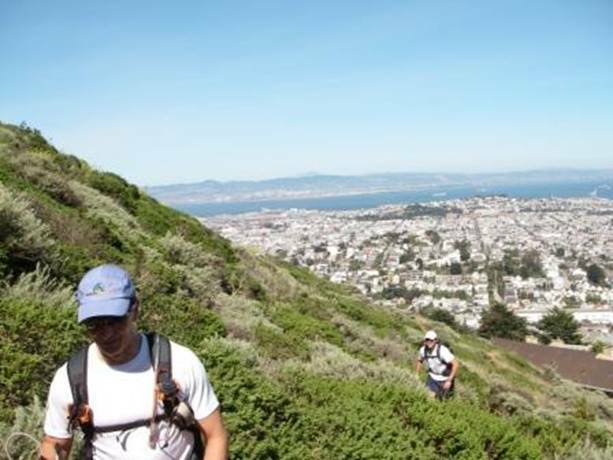 On the day over 60 teams showed up to race around the City for one of the most fun urban adventure races on the calendar. 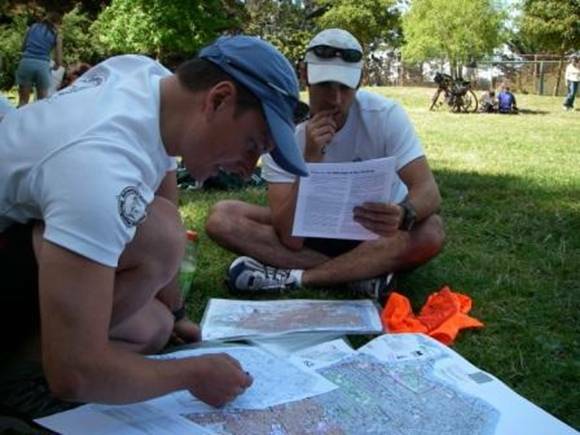 The format of the race would be 60 checkpoints around the City on a course that was designed for the top teams to be able complete the whole thing in 16 hours. The first 8 hours would be on foot and the second 8 hours would be on bike. We were told that the bikes would not be given to us until 8 hours had passed. The maps were handed out at 2:30 PM. We had to plot a route on our maps and mark up an intention sheet of our proposed route for the organizers. We were told this was in case we went missing and they had to track us down. Grant did the running around and gear organizing while Peter and I set about plotting a route. I drew on the experience from the previous year and estimated the checkpoints that we could complete in 8 hours of running. We planned the best route to those points taking into account the 3 points that had early time cutoffs. We then plotted the bike route and I highlighted the map with the route that would seem to be the flattest given the ever changing contours of San Francisco. The Basic Roamer AR came in handy at that point for calculating the various distances we’d need to cover and to estimate our times. As time got closer for the 4:00PM start we folded the maps, put on our backpacks and made sure we all knew where we were going out of the gate. We had decided to do the most climbing at the start while we were fresh. This meant that we would go out of the gate and climb the 500 feet straight to the top of Twin Peaks where they have the radio tower. We picked up one token point that was on the way and found a small dirt trail that wound up the side of the hill. At the top Grant and Pete broke out the cameras and took advantage of the clear view from the 902 foot peak. From Twin Peaks it was all down hill into the Mission to pick up the checkpoints that had early time cutoffs. Once we got those we could relax a little and settle in to picking off all the points we had selected before heading back to the transition. We decided to have some fun at the ball park. 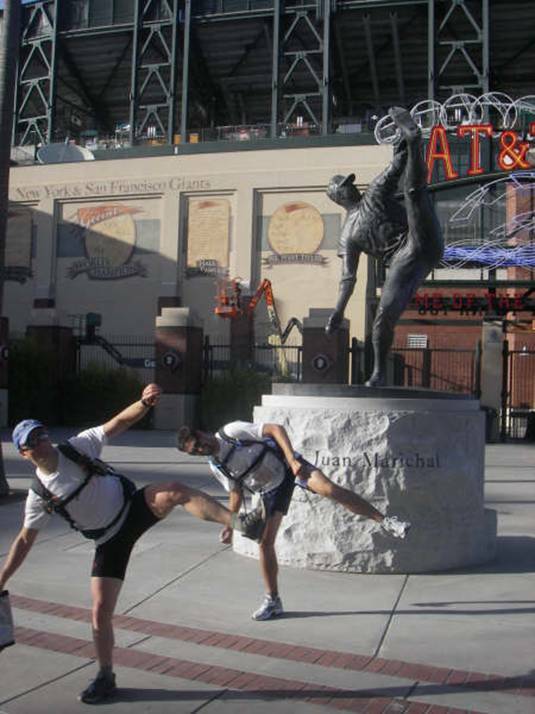 Grant wanted to see how a Brit would look pitching a baseball so they showed me the statue and I had a go myself. Not bad for someone who grew up playing cricket. After a visit to the ball park and a run along the Embarcadero we cut back into China Town for the checkpoint at the China Town Gateway. It was here that we ran into Oliver Pohl and his team True Grit coming in the opposite direction. Everyone said hi but no one wanted to stop as we both knew that the other was out to win. As we entered China Town the whole team was hungry. It was now about 7:30PM and time for dinner. We couldn’t decide what to eat but whatever we wanted it had to be fast. Peter had the bright idea of a rice bowl so we made an immediate stop at the first hole in the wall and ordered 3 rice bowls to go. Grant as usual wanted more and managed to swallow 4 pot stickers whole before we’d even finished ordering. At this point the Dirty Avocado’s stuck their heads around the door and took our picture. That must have looked funny to everyone else in the shop. We picked up the food and ate it on the run, plain rice with soy sauce never tasted so good. After China Town it was the loop out to Fisherman’s Warf and a checkpoint at Fort Mason before heading and South picking up points on the way back to the bike transition. As we looped south the wind was blowing the fog into town and we started to get cold. We broke out the warm cloths and continued running a lot more comfortable. I was dark when we hit Haight Street. As we ran past all the head shops and tattoo parlors with out headlamps on, we came across some guys sitting on the pavement smoking. As we passed them, all we heard was “Dude, I was tripping out, those guys had lights on their heads” I guess we did look kind of strange to the Haight Street natives. We had planned on arriving back at 11:30PM to give us a little recovery time before jumping on the bikes. Out plan worked perfectly, we were back at 11:32PM having got all of our run checkpoints. We ate a bunch of food and prepared the bikes ready for our 12:00 AM restart. A bunch of other teams came in, including Oliver and True Grit closely followed by the Dirty Avocados. Not much was said as everyone was getting ready and recovering. At exactly 12:00 we hit the road, none of the other teams seemed to be ready so we took advantage of the head start and hammered the first few checkpoints. I’m not sure what routes the other teams took but we all seemed to come together at Candlestick point. This is not a good place to be in the middle of the night so we collected the point and got out of there as soon as we could. We rode for a while with True Grit before going our separate ways at the next CP. The next section was going to be hard as it involved another long climb. Basically sea level to the radio tower at the top of San Bruno Mountain at 1314 feet. This was going to be a long slog to the top. It seemed to go fairly quickly and the ride down was fantastic. Both Grant and I were using the NightRider Moab lighting system on full beam and the road was very clear. On the way to the next checkpoint we passed Jen Klafin of team www.BAARBD.com going in the opposite direction. Not much time to say more than hi as we were doing 30+ mph downhill. This started the long ride out to the coast for the tip North to Golden Gate Park and eventually the Golden Gate Bridge. 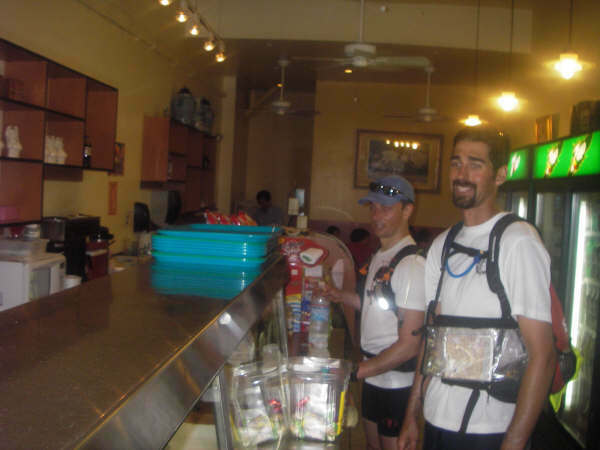 When we hit the second checkpoint at the coast we ran into 2 other teams who had also just arrived. We quickly got the checkpoint and hit the road. We wanted to get away from the following teams as soon as possible so we threw out the tow line to Peter and hit the highway. I had Grant ride a good tempo at the front of the line while I towed Peter at full speed in Grant’s draft. This worked really well, we were flying. We managed to get the next CP and leave before any other teams arrived. I’m not sure what speed we averaged but we were flying. The sun was just starting to come up when we hit the Golden Gate Bridge and looped down into the Presidio. We flew down the hill into Crissy Field and were immediately stopped by the Police. They’d seen the Moab lights coming from miles away and had decided to investigate. After a very short lecture about obeying traffic laws, including one way streets and stop signs he let us off with a warning. At this point we noticed a whole bunch of people arriving at Crissy Field with Tri bikes on their cars. This was the day of the Escape from Alcatraz Triathlon and the athletes were getting there early. It looked like they would have a nice day for it. They must have wondered what the hell we were doing. I was just happy to be heading back to the finish and the end of the race. I was thinking about the poor people who were about to jump into the cold bay at 7:00AM. I’m glad I do adventure racing where you get a kayak. The last couple of checkpoints were the most painful of the whole race as they involved a bunch of climbing before the end. I had the feeling that Oliver would be pushing hard and that this would be a close race so there was no letting up on the pace. As we arrived at the finish having got all of the CP’s we were greeted by the organizers. Jen of www.BAARBD.com was there already. They had missed some CP’s and came back a little earlier. If all of our CP answers were correct we were the winners. It was now a matter of waiting for the confirmation from the judges and the announcement. We were confident and Jen gave us loads of congratulations. Just 10 minutes later Oliver and his team arrived. They also missed 2 CP’s due to the time cutoff and because of that where pushed into third place by the Dirty Avocados. We had taken the win as the only team to get all the CP ‘s for a maximum of 3000 points and we came home first. This was a great win for ARNavSupplies.com/Nomad. I had now been on the winning team for San Francisco Night and Day two years in a row, I love this event. Below is a list of all the CP’s we went to and the order that they were collected.